Whether you’re thinking about braces or you already have them on, your main reason for choosing braces is probably because you want straight teeth. In fact, more and more adults are now getting braces, increasing almost 40% since 1996. Braces will definitely make your teeth straight and more aesthetically pleasing. But there are also many health benefits of braces that you may not yet be aware of. Read on to learn about some of the excellent health benefits of braces. Sure, most people get braces because they feel self-conscious about their teeth and they want straight teeth. But once those braces are on, you’re going to have an average of 18 months to two years of braces. That means dealing with tightenings and changing your diet. If you’ve talked to an orthodontist, they may have told you that you have an open bite. An open bite can be problematic for a number of reasons. When you have an open bite, some of your teeth no longer meet, which can make it impossible for you to chew. 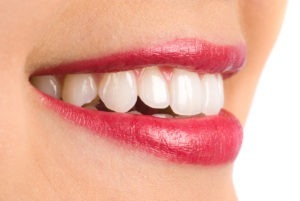 This also places much more pressure on the teeth that do meet, causing them to break down faster. This can be embarrassing when eating in public and can lead to digestive issues as well. For adults with sleep apnea, it turns out prioritizing straight teeth can help with this as well. For many people, obstructive sleep apnea is the end of a long process beginning before birth. When you choose to get braces, you’re improving your bite and jaw, ensuring you have a healthy airway. This means less snoring, less irritation, and less obstruction. When your teeth are crooked or crowded, you end up with tight spaces between teeth. This means that food is less likely to be removed when you’re brushing your teeth and swallowing water. Over time, that debris turns into plaque. And with plaque comes cavities. It’s also more difficult to floss in tight spaces, and when you can’t floss, you’re more at risk for gum disease. Your teeth placement affects how much pressure is placed on your jaw bone while you’re eating and speaking. That pressure is important, because it stimulates bone growth, holding your teeth in place. When you have misaligned teeth, too much force is coming down on some teeth while you eat. This slowly erodes the bone. It also means that there isn’t enough pressure on other areas, leading to a lack of stimulation. Braces move your teeth back into the right place, so you have the right amount of pressure for a healthy jaw bone. As you can see, straight teeth have benefits far beyond the aesthetic appeal. If you’re looking for the health benefits of a perfect smile, get in touch today to learn how we can help. To learn more about Health Benefits of Orthodontic Treatment order your copy of “A Healthy Happy Smile; Eight Reasons to Straighten Your Teeth” by Dr. Alexa Alborzi.